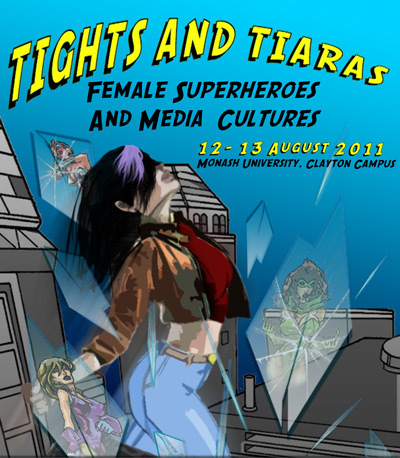 I recently attended Tights and Tiaras, a wonderful conference hosted by Monash University exploring the representation of female superheroes in popular culture. I found the conference to be such an enjoyable experience, represented by so many interesting and talented people, that I simply had to share it. Amongst others, the two-day event was host to: Karen Healey, young-adult fiction writer and blogger extraordinaire; JKB Fletcher, a local artist whose remixing of Superhero iconography with everyday women was both powerful and provocative; and a host of other inspiring and inquiring minds. My own presentation, which explored how dispersed semiotic contexts can be bridged in Joss Whedon’s Buffy The Vampire Slayer (or, how Buffy got by with a little help from her friends), was well received and I was inspired to expand my research based on feedback from the audience. Just some of the fascinating topics discussed included: Lenise Praters exploration of Superwomen with power in the X-Men franchise; Alexandra Heatwole’s discussion on reconciling the feminine in Buffy; Michelle De Stefani’s insightful analysis of the Supermom archetype in contemporary parenting literature; and Jane Felstead’s visually confronting look at the representation of female characters in one-on-one fighting games. At this stage I can’t find a conference program or video footage online; however, you can access the website here. Somewhat serendipitously, I won the season 8 Buffy comic in a conference raffle on the second day. Fan-girlish excitement ensued… I was even asked to share my thoughts on Buffy in an interview with Sonja, from Joy FMs Sci-fi and Squeam, a local radio presenter who kindly indulged my delight at being given the opportunity to speak about Buffy as a fan. The show airs August 23rd as part of a Whedonverse special. Tune in for unadulterated nerdy Joy. Sounds like a really neat conference. I enjoyed reading about it.